Find My Workspace lists over 95% of the serviced offices market in JingAn. Simply click Request Quote to check pricing for one office, or Add to Basket for multiple offices. This centre is located on the 8th floor of this 32-storey Grade A office building located in the fast developing Jing’an district of Shanghai. This is part of a significant mixed use development, with a 50,000 m² international retail mall forming part of the scheme. Local amenities such as Ambassador Hotel, Ryden Yage Hotel, Jade Butterfly Restaurant and China Merchants Bank are in close proximity. 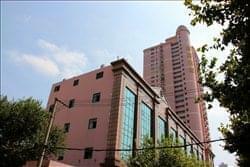 This center is located in the heart of the French Concession and is walking distance from Jing’An Temple, an established top address in Shanghai’s serviced office sector. Office sizes range from 2-12 people and are defined by their powerful design. All the offices come fully furnished and with beautiful common areas including a fully stocked and equipped kitchen, lounge and meeting rooms set up with the highest standards. The center also offers a fresh and minimalistic design to establish a unique and characterful working space. This centre has 46 available rooms from 1 to 10 person offices, a communal kitchen, one 10-person conference room, and one small meeting room, and offices with panoramic views. This brand new business center is bright and equipped with highly advanced telecommunication technologies. Just a stone’s throw away from Nanjing Road West, this centre immerses you in an impressive and spacious world of business. The appeal of precious materials of solid quality as well as state-of-the-art building equipment gives the visitor a feeling of exclusivity. Recognising the strategic importance of an efficient office infrastructure provides a fully integrated business center environment complemented by modern luxurious design. This luxury business centre concept eventually implicates high-quality service which is performed by the perfectly trained bilingual staff and grounded in high-end technology. This centre offers all-inclusive serviced offices to enable clients to achieve a higher return by increasing productivity. It also offers more spacious and efficient workspace, fully equipped suites and a higher level of services. This centre is in the heart of Shanghai’s central business district and a block away from People’s Square, a large public space that’s home to Shanghai’s municipal government HQ. The office space is located on the 18th floor of a tall glass office building, there are views over the city from some of the offices. The building is home to many high profile international corporations such as those working in car manufacture, technology, electrical installation and electronics. 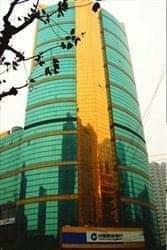 Nanjing Road West is famous for its shopping and has one of the longest shopping streets in the world. Several five star hotels and luxury apartments are also nearby. Pudong International Airport is a 45-minute drive while Hong Qiao airport is 30 minutes away from the offices. 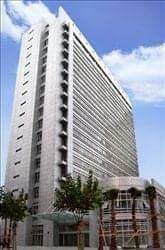 This serviced office centre is located in a brand-new international Grade A office building and mall located in the CBD of the popular Jing’an District in Shanghai. 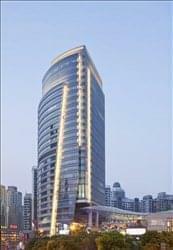 The building forms part of the new high-end office and retail development around Wheelock Square on Nanjing Road. This is a 17-storey Grade A building offering a range of workspace options, a fully equipped conference centre and ground floor retail outlets. This center combines the best of both worlds: conventional lease and serviced offices. Total floor area of the building is 14,000 m² and suites ranging from 10 to 5,000 m² with flexible one to five-year terms. A complete floor dedicated to 18 fully-equipped meeting rooms is suitable for training and conferences for up to 200 people. A wide range of facilities and services are available such as café lounge and restaurant. This building is spread across four floors and currently contains a mix of creative agencies, designers, photographers, and start-ups. 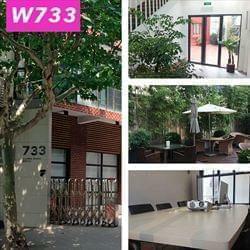 It provides the amenities of a serviced office but with a creative atmosphere. Building access is available 24/7, the lobby has receptionist daily (9am-6pm) along with shared bathrooms, a fridge and a microwave. There is a meeting room on the third floor with a projector and Wi-Fi access and can be booked anytime. There are a number of great outdoor spaces including the fourth floor terrace that is very sunny and private and an enclosed courtyard on the ground floor. This centre provides a perfect space to work, meet clients and hold presentations. It offers a perfect solution for local and overseas companies looking for flexible and fully-equipped offices with comprehensive services including 24-hour access, car parking and good transport links. This centre combines flexibility of space and a wealth of features to create a truly user-focused work environment. The building also boasts a retail facility, including many shops, cafés and services. 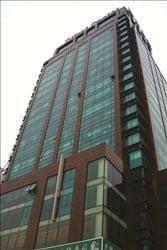 Located in the business hub of West Nanjing Road CBD, the office space is situated on the 16th floor of a this modern Grade A development. As one of the most famous commercial zones in Shanghai, West Nanjing Road features upmarket malls, prime office buildings and the Shanghai Exhibition Centre. 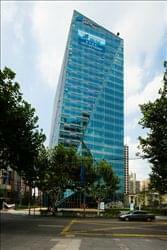 This landmark building, close to the People’s Square, has a retail center with an outdoor gourmet section making it the hippest meeting setting in Shanghai, coupled with a superb working environment upstairs, it perfect for international corporations. This centre is renowned for attention to detail, with Aaron Herman Miller chairs, state-of-the-art award-winning CISCO IP telecommunications and network connectivity. The modern corporate design is complimented by panoramic views of old and new Shanghai, cutting-edge office suites, inspiring break out areas and full range of business amenities. 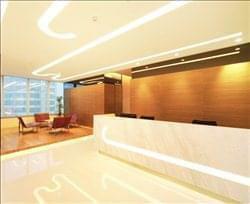 In the heart of Shanghai’s busy central business district, this centre could not be better positioned. This centre is the most prestigious commercial complex in the heart of the Jing’An Temple District, if not the whole of Puxi, Shanghai. The complex comprises of three premium Grade A buildings including the Sangri – La located on the historical Nanjing West Road. Office solutions here include world renowned cloud based global communications system, specially designed business registration offices and fully furnished office suites with an excellent team support network. As a client, you will enjoy services and facilities such premium Internet access with 99.98% uptime and unrestricted access to global websites, professional reception services, immaculate corporate kitchenette and spacious meeting and conference rooms. To obtain information for your selected JingAn Serviced Offices, please tick the "Add to basket" box for each office you prefer and complete the form below. We will then send a detailed report via email.